ASU will mark the 100th anniversary of Roosevelt’s speech with a brief program that includes the reading of the speech and the debut of a traveling exhibit at 3 p.m. March 21 in Old Main. Refreshments will be served. Roosevelt, who had left the presidency in 1909, was in the Arizona territory to dedicate a dam, named in his honor, which was located some 60 miles northeast of the Salt River Valley, at the confluence of the Salt River and Tonto Creek. 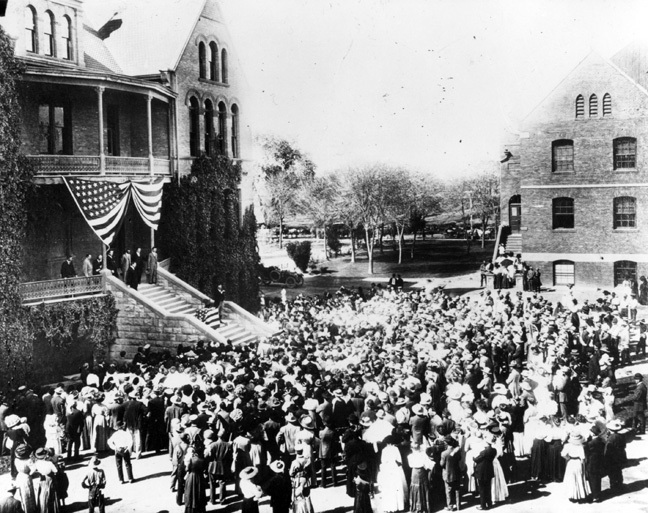 Instead, Roosevelt was greeted by hundreds of well-wishers, including many students of Tempe Normal School (which would become ASU). He spoke for 13 minutes, according to a story in the Tempe Normal student newspaper. A photograph of the occasion shows Roosevelt on the steps of Old Main, under a large, glorious US flag that was hanging from the balcony. “It is a rare pleasure to be here and I wish to congratulate the Territory of Arizona upon the far-sighted wisdom and generosity which was shown in building the institution. It is a pleasure to see such buildings and it is an omen of good augury for the future of the state to realize that a premium is being put upon the best type of educational work. Moreover, I have a special feeling for this institution, for seven of the men of my regiment came from it,” Roosevelt said. “It is of the utmost consequence in any community, but especially so in a community that has just ceased being a frontier community, to provide the best educational facilities for the next generation,” he continued. Roosevelt’s remarks, delivered in his well-known direct style, touched on two sides of education. “The heart of Roosevelt’s speech goes far beyond the politics of time and place,” said Susan Gray, an associate professor of history in the School of Historical, Philosophical and Religious Studies in ASU’s College of Liberal Arts and Sciences. “His speech is about what a state needs to be a state, and about the role of different levels of government in securing those requirements. “All states, according to Roosevelt, needed a secure economic base and an educated citizenry. It was the role of the federal government to do for the people what they could not do for themselves, either as private individuals or through state and local government,” said Gray, who will provide a context">http://asunews.asu.edu/files/TRspeechSusanGray.pdf">context for the speech during the commemoration. "President Roosevelt's speech at Old Main took place when Arizona was still a territory and when ASU was hardly more than a gleam in the eye of a few schoolteachers,” said associate professor Kent Wright, head of history faculty. “It is instructive, even awesome, to be able to look back and think about all the changes that have overtaken both the state and the institution in just a century, which isn't very long in the scheme of things. That's the bread and butter of what ASU’s Public History Program does; remind us where we belong in the larger scheme of things, and to do it in a stylish and entertaining fashion,” said Wright. Quentin Wheeler, ASU vice president and dean of the College of Liberal Arts and Sciences will provide opening remarks at the commemoration and introduce Thomas Walsh, a graduate student in public history, who will read Roosevelt’s speech. Wheeler, an entomologist, has a number of special presentations planned for the commemoration, including a US flag provided by the office of Sen. Jon Kyl, which was flown at the Capitol in Washington D.C.
Also planned is the debut of a traveling public history exhibit comprised of three large display panels with the text of Roosevelt’s speech, as well as photographs and documents from that time period. Plans are to have the exhibit, titled “The Great Material Chance: Roosevelt Roots for Education,” displayed at the state Capitol and at all four ASU campuses over the next several months, leading up to the state’s centennial on Feb. 14, 2012. More information about the commemoration of Roosevelt’s visit to the Tempe campus, including a copy of his speech, are at http://shprs.clas.asu.edu/roosevelt">http://shprs.clas.asu.edu/roosevelt">http://shprs.clas.asu.edu/roosevelt.... News about other events and activities that are part of ASU’s Project Humanities are online at http://humanities.asu.edu.">http://humanities.asu.edu">http://humanities.asu.edu. Beate Jones and Madison Snowden will compete for a title at the NCAA Norman Regional hosted by the University of Oklahoma, April 2. The Arizona State Women's gymnastics team will send two Gym Devils to Regionals this season. Junior Madison">http://thesundevils.cstv.com/sports/w-gym/mtt/snowden_madison00.html">Ma... Snowden qualified as an event specialist and will compete on the floor exercise as an individual. Snowden has been a tremendous contributor for the Sun Devils on the floor exercise performing on the event in every meet of the season. She scored a 9.900 and above four times, tallying a 9.925 as her season-high. Jones and Snowden will attend the regionals hosted by University of Oklahoma on Saturday, April 2 at 4 p.m. CT.